I have always wanted to find a reason to keep engaging with customers, fundamentally, to help build better relationships with them. What if there was an informative reason to keep having these conversations, like a new data sheet, product feature update, or a white paper that is relevant? There is always something innovative that is happening in our enterprise. For example, product management rolls out new features every quarter, field engineers regularly blog about their workarounds, and our marketing teams always share their latest whitepapers. 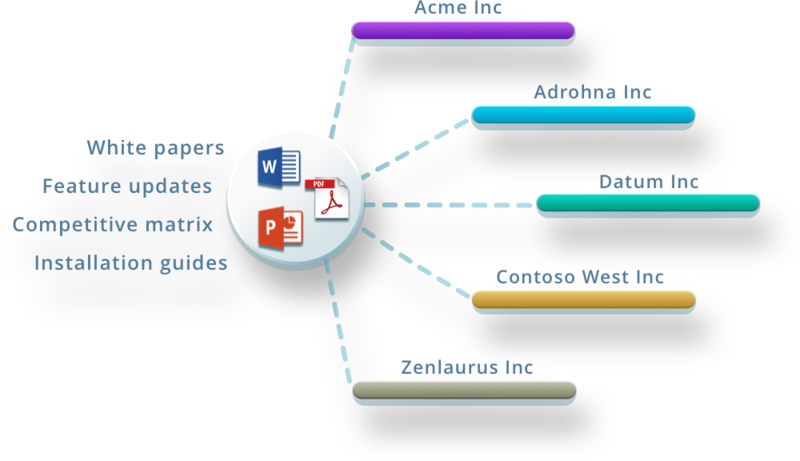 Sync-and-share platforms like Sharefile, OneDrive, Box, Dropbox, or SharePoint play a key role in providing access to the enterprise content. Once these documents become available, the burden is shifted on to me to figure out which one I can use for my customers. If I were a system integrator, distributor, or reseller, it would be even worse. I would have to deal with a plethora of customers on one end and a whole bunch of vendors on the other. It would be even more important that I stay on top of my customer relationships and lock the deal before someone else does. Vendors often point us to the shared directory for new product updates with email alerts that I often overlook. Eventually, if I were to get my hands on some cool content, I would still have to spend time in figuring out whom to send it to. This is how I would do it today: make a mental list of customers, and start writing each one of them emails with attachments. I can’t remember all of the 50 or more customers whom I am dealing with at various stages now. As a result, I am missing out on the whole bunch of them. I can’t be going through this process every day! This whole process is cumbersome, and I have found no tools that can help me do this task automatically. So, I take the easy way out of not doing it, often losing an opportunity to get a deal done! 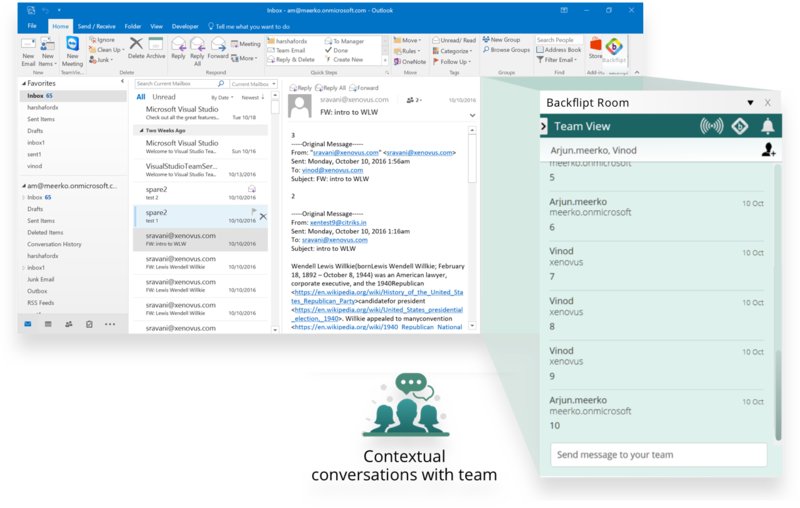 With Backflipt, all I do is let Backflipt talk to my email server and my shared folders such as Sharefile, OneDrive, and Box. It builds a graph of my customer conversations with related interests and suggests a list of customers whom I can engage with whenever there is new content that gets loaded into shared folders like ShareFile, OneDrive, Box, Dropbox. Customer recommendations save time and give me a qualified reason to engage in conversations; I can send a recently published white paper by the marketing team, provide information on a new product launch or performance matrix that could secure the deal. For each of these customer recommendations, it brings up the exact email thread that I have with that customer. Therefore, I can simply send it with a click. It is a brilliant to continue an ongoing conversation with new information, these communications are informative and don’t come across as a hard sell. Backflipt’s ability to automatically fetch an existing email conversation saves me time, it’s ability to pick the latest, and relevant thread makes it very powerful. More importantly, it does provide a workspace in the email thread where I can have a quick conversation with my colleagues or even the content creator before sending it out: on-demand curation with context. That’s pretty cool! Another cool thing about Backflipt is that it automatically stays relevant all the time. Backflipt shows me a list of customer recommendations when they become available, and it always stays current as I continue to use Outlook as usual.